The New York Public Library (NYPL) has launched a new feature to its Instagram account: turning its Stories feature into a place to host actual stories. 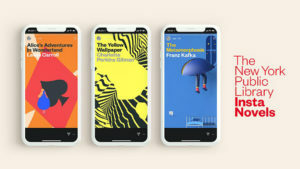 This feature, which NYPL has called ‘Instanovels’, shall include classic works starting with Lewis Carroll’s Alice in Wonderland, formatted for the mobile space with illustrations throughout to enhance the reading experience. Essentially, many of the classic works in the library’s resources can be used to help make the instagram account much like the e-readers that once threatened the existence of establishments like it. Readers of this book are greeted by the titular protagonist walking through the rabbit holes and the various themes — tea, playing cards, and the like — float through the screen. Mother New York partnered with the city’s largest library system on this project, which allows readers to use the stories mechanic to ‘flip’ back and forth by pressing the corresponding sides to the screen. They can also hold down on the page to read through the dense material, and watching as animations take over the cover, some chapters and key moments in each novel. And if you lose track, Instagram’s recently-added highlights feature will allow you to quickly catch back up. Next in line for the NYPL’s mobile series: Franz Kafka’s Metamorphosis, and short story The Yellow Wallpaper by Charlotte Perkins Gillman.